In today's business environment, it's highly important that an organization's staff has the capacity for total mobility while still having access to core business applications. VanBelkum Companies, a leading provider of voice and data technologies since 1959, has announced a partnership with Winscribe Mobility to deliver a suite of mobile dictation solutions to an expansive client network covering healthcare, legal, financial, government and other heavy-record industry segments. Winscribe Mobility is a secure, easy-to-use mobile application that complements established business processes. 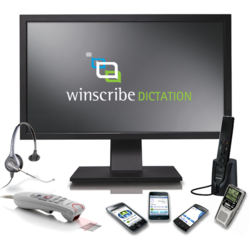 By partnering with Winscribe Mobility, the world’s largest supplier of digital dictation technology, VanBelkum believes they are a step ahead of competitors. The Winscribe technology gives thousands of professionals the ability to streamline and automate their document creation process by providing instant transfer dictations. Dictation applications are available for any Blackberry smartphones, Android devices, iPhones, iPod Touch devices and iPads. Digital dictation services improve organizational efficiency, output and employee performance. By providing features such as speech recognition technology, business professionals are seeing shortened document turnaround time, which in turn increases overall productivity. For a complete list of the features unique to Winscribe Mobility, visit http://www.vanbelkum.com/vanbelkum-presents-winscribe or call VanBelkum’s corporate headquarters in Grand Rapids: (616) 301-7676. Since 1959, VanBelkum has helped small and medium businesses integrate cutting-edge voice and data technologies to optimize communications, increase productivity and reduce costs. From VoIP phone solutions, to dictation systems, to transcription services, companies trust VanBelkum to make technologies work with their existing infrastructure in a cost-effective, intuitive way. Experience the VanBelkum difference at http://www.vanbelkum.com.